MANILA -- The Department of Transportation (DOTr) and its attached agencies will be on heightened alert status in preparation for the great volume of passengers going to the provinces during the Holy Week break. This as the DOTr is set to implement its Oplan Biyaheng Ayos: Semana Santa 2019 from April 8 to 25 to ensure a safe and convenient commuting experience for passengers who will troop to the ports, terminals and airports across the country. In a statement on Tuesday, Transport Secretary Arthur Tugade said the initiative aims to provide security to commuters as they spend their vacation. “It is important for the DOTr to ensure the safety and welfare of the riding public. That is why I have instructed all attached agencies to exert all efforts to assure safe and comfortable travel to our countrymen as they go to the provinces or vacation spots during the Holy Week,” Tugade said. The Land Transportation Franchising and Regulatory Board (LTFRB) has issued special permits to buses that will travel to the provinces during the Holy Week. 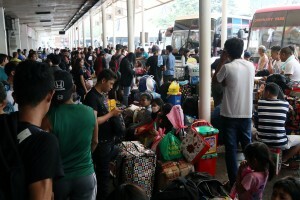 As of April 1, the LTFRB has received 484 special permit petitions for 1,133 bus units that will travel in Northern and Southern Luzon, Bicol, Visayas and Mindanao from April 14 to 22. The Board will also conduct random inspections of units and franchise documents beginning April 10 with the Inter-Agency Council on Traffic (i-ACT), as part of ensuring the safety of the passengers in areas where i-ACT operates, and with the Land Transportation Office, Highway Patrol Group, and Armed Forces of the Philippines in other parts of the country. It will also intensify its operations against illegal or “colorum” public utility vehicles and taxicabs with franchise violations. Passenger assistance desks that will be operating on a 24/7 basis will likewise be installed in major ports, terminals, and airports in the country to address queries and complaints.